The introduction of tablets into the marketplace has helped improve the services provided in many industries, especially in the added value these devices have brought to healthcare. Many healthcare facilities have moved to better incorporate tablets across their entire organization to ensure that various systems are more robust and efficient overall. The healthcare tablet market is expected to hit $1.7 billion this year according to Clinical Innovation and Technology. Tablets like the iPad will continually be incorporated into many different types of medical facilities because of the many benefits they offer to both staff and patients alike. There are 97,000 medical apps available today, most of which are available on the major tablets like iPads, Kindles, Nexus and others. This gives staff members a variety of uses for tablets, like using healthcare apps for more in-depth information on different medical disciplines or as tools to help better an existing process or task. Tablets are easily transferable around a large or small medical facility as opposed to a clunky computer or small ineffective mobile device that is hard to utilize quickly with such a small interface. Some tablets provide a wide range of models with varying price points. There are even discounts for furnishing whole organizations with a line of tablets. In every case of tablet adoption, battery life was significantly higher than estimates predicted. This allows medical professionals to focus on patients and their daily tasks, as opposed to dealing with the battery and functionality issues of their devices. Tablets are simple and intuitive to use for people of all ages and skill set, no matter their background. These devices are often a healthy balance between the alternative, since they are less complex than a laptop and more intuitive then mobile devices. It is important that these devices are simple to use because the staff of most medical facilities is large and may require additional training if not familiar with the device or apps your organization elects to use. There are many different systems that make up the ecosystem of a hospital or other type of medical facility, which is why is often easier for tablets to communicate and integrate with these systems quickly as opposed to alternative methods. Since tablets are extremely beneficial to the healthcare community they’ve been incorporated extensively through out many different practices, hospitals and other medical facilities. The adoption of tablets across the healthcare industry has forced experimentation and innovation in terms of the apps and technologies being produced for use on these devices. 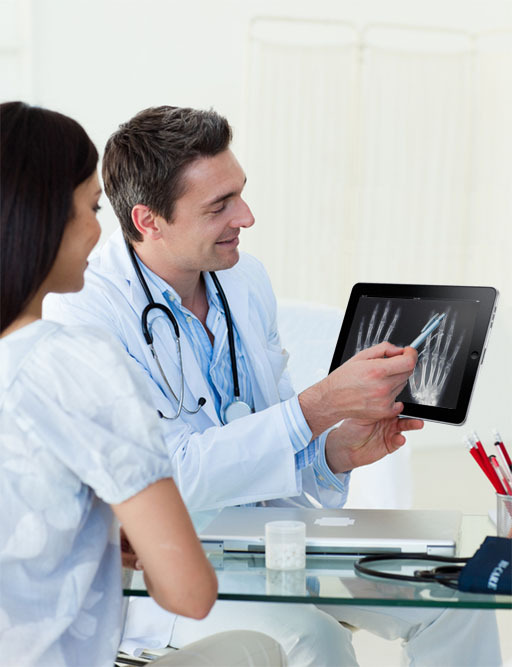 Tablets in hospitals, doctor’s offices and other medical facilities allow staff to access reference copies of X-Rays, PACS images, ultrasounds and more. This technology allows for quicker comparative studies between two patient visits, which helps deliver more accurate and timely results for patients when medical staff is more equipped to perform their duties. Tools like Mobisante allow medical professionals to connect a ultrasound probe to a mobile device or tablet to conduct ultrasounds in a much more cost effective and mobile format. The Mobisante tool also enables providers to use the system for prostate and gynecology imaging as well. When more basic imaging is conducted on tablets, film costs and technical labor expenses are also reduced, which helps save the organization money as a whole. Reduced costs and more efficient patient care is always a plus for any medical facility looking to reduce their bottom line. Tablets now allow healthcare organizations access to scheduling and resource planning information from anywhere, as they move about their facility. This is an added convenience for medical professionals who no longer have to synch with other facilities or departments since most of the necessary information needed to schedule patients visits and find the information they are looking for is right at the palm of their hands. These devices also help streamline the process of medical billing to ensure it is more accurate and timely across the organization. With this accuracy, comes more complete and efficient insurance claims filing and processing to an already innately complex system. Improved accuracy of patient data is an extremely important use of tablets because they help the entire healthcare system remain consistent and organized across different facilities. This is beneficial to patients moving between healthcare facilities because all their necessary documentations is available wherever they need it to be, as well as for staff who can quickly access this information to administer treatment to patients. By nature, consolidating information that’s easily accessible on tablets can help eliminate the entry of redundant data. The less redundancies in healthcare records the better for the continued growth of effective healthcare and better treatment and services for patients. The speed at which this information can be access by medical professionals obviously helps attribute to the increase in patient care, since there is more time to focus on patients as opposed to the technology used to assist them. The ability to easily educate patients is important for their buy-in and overall understanding of their condition, injury or ailment. 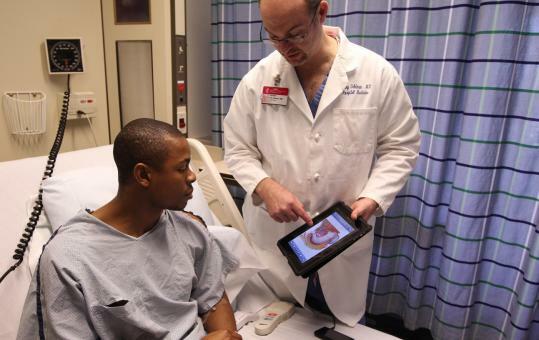 Tablets make educating patients with videos, animations, diagrams and other visuals easy from their bedside. Patient education is important because it allows the patient to better understand what’s happening to them medically, which will ideally help them better explain how they are feeling and reacting to treatment when they speak with medical professionals. Tablets make patient education mobile and more effective due to the compelling power of visuals which help drive home the understanding of a concept far better than just words on their own could. CPOE or Computerized Physician Order Entry is a system that allows direct entry of medical orders by the person with the licensure and privileges to do so like a practicing physician or surgeon. 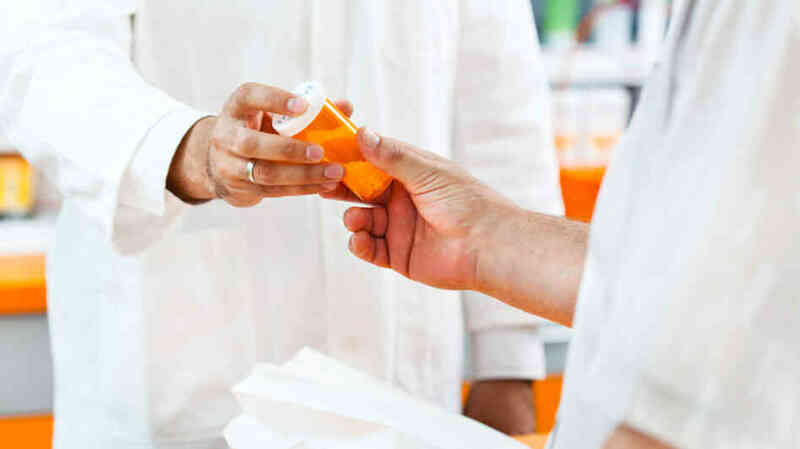 Directly entering prescriptions and other medical orders into a tablet has the benefit of reducing errors that are typically found in hand-written orders, which can be an extremely serious issue if not properly addressed. One of the greatest benefits of tablets giving medical practitioners greater access to CPOE is the fact that all of their other support tools like clinical documentation, practice management and mobile imaging can be found on the same device for better collaboration across systems. With the use of CPOE on a tablet there is a reduced need to clarify information prior to prescription fulfillment, which once again helps both protect the patient and save much needed time for staff. Tablets offer easy access to up to the minute updates on drug-to-drug and drug-to-allergy contraindications to again ensure that your patients are protected and your staff has up to the minute real time information on how to protect them. Lastly, time is saved across the board because prescriptions are processed right away from the tablet increasing the speed and efficiency of the entire experience for both patients and staff. In the end, tablets and similar technology will continue to alter the way that the healthcare industry operates to provide a better experience for everyone at every part of the process. Smart watches, Google Glass and other innovations in wearable technology will be the next wave of impactful systems to change the way healthcare is administered to be even more mobile, intuitive and connected. 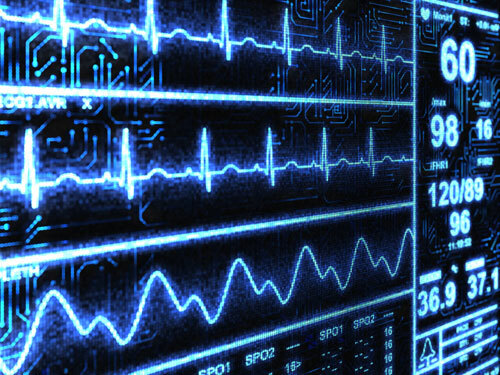 There will be a stronger emphasis on the connected revolution, which continues to address how each device in the ecosystem at a healthcare facility will connect with one another to pass data and actionable insights to provide better value. The smartphones used by medical staff in their personal lives will continue to have the ability to connect wit medical devices at hospitals, practices and other medical organizations to help these professionals better perform their job on behalf of their patients. Medical knowledge will become even more easily accessible than it is today as the growth of apps continues to allow medical information to become more robust, more affordable and even more accessible on any device you’re using personally or professional. This is a dire need to encourage the improvement of the healthcare industry and mankind’s understanding of the many medical issues that still plague us. With more readily available medical information, more innovation will occur like what this 16 year old did to research and develop a method to detect three forms of cancer that costs 3 cents and 5 minutes, which makes it 168 times faster and 400 times more sensitive in detecting cancer than current methods of diagnosis. This was done initially through online research and access to medical documentation, prior to the test development in a medical facility. In 2014 there will be 30 to 40 million Americans entering the healthcare system, which will require the entire industry to be a more cost effective and efficient machine when it comes incorporating technology. Not focusing on how more of the day-to-day processes in healthcare can be positively impacted by tablets and other emerging technologies is a step back in the wrong direction. Now’s the time for a technological disruption to help impact every aspect of the healthcare ecosystem for the future. How is your medical facility utilizing tablets across the organization? What use of tablets in healthcare do you find the most impactful? Please let us know in the comments below. Images courtesy of Archelonen Closures, Philipp Datz, Boston.com, SecurEdge Networks, iPost, NPR and Lunar.